The random space of expression that may or may not have any significance to anyone, to society, to anything...I am everyone and no one. I am everything and nothing. I am everywhere and nowhere. bNowhere - because the world is smaller than we think. For those of you that have been following my photography projects, or who've seen some of my photos on Flickr or elsewhere, now you can find the Devils Within collection in the book, Franco Esteve's Devils Within, available through the Blurb publishing service. Franco Esteve's Devils Within is an exploration within that spatial interaction that occurs within our lungs, alive, between body and nature, between the smoke and the cell. Its visions look for those demons that exist within us, within ourselves, within the smoker. Each person has their own interpretation, their own understanding, their own vision of that which exists within. In many ways, the images serve as a rorschach test of sorts, and though many see the things which I understood are there, others see their own visions, their own thoughts, their own demons and emotions. It's real. It's there… inside the smoker. Get your 3D glasses ready! The book utilizes anaglyph stereo images (red and cyan) to better convey the depth of its photos, like looking through a window into the smoke, and though it's recommended to have 3D glasses available to fully experience the depth of that within the smoke, they are certainly not a requisite (The 2D versions of the photographs are also included). If you need glasses (red and cyan), you can get them from Amazon (USA) here or Amazon (UK) here. These are the most economical glasses and are often given away. You might even have one laying about the house. I sincerely hope you enjoy the book and the images within. It's currently available in a highly economical 7 X 7 inch square format, and has a full preview available so you can peruse the book before purchase. You can get it here. It makes a great gift with some 3D glasses! :) You can also buy framed prints from this collection @Imagekind here. Stay up to date about this collection and my other projects right here at bNowhere.com, or you can visit me at my official website (www.francoesteve.com) here. You can also follow bNowhere on Twitter (@bnowhereblog) here. You want me to what? I don't think so. You shouldn't have to register to shop. Ok, to start, I'd like to preface this by saying that I understand the desire for companies to ask users to register their products. It makes it much easier for them to handle warranty information and provides them with information about their customers which they can use for metrics, future products, marketing, etc., and also makes it easier for their customer service to serve their customers. It would seem like a win-win. I understand it, except I don't. I bought a new toaster: please register. Why the hell would I register a 20 dollar toaster which I will toss if it breaks down a few months down the line and get another? I don't want to register my toaster. Now, it's true that I don't have to send a card for the toaster if I don't want to, but what happens when the toaster won't work without registration and/or activation. It sounds silly doesn't it, using the toaster as an example, but that's the direction that companies seem to want to take us. Companies are focused on forcing us to give out our personal information to use their products. Software companies have been doing it for a long time, but more and more companies are asking for more and more information and forcing us to give them something much more valuable than our money... ourselves. What happens when your new digital, 3D, ultra, super HDTV, mega screen television decides that before you can use it, you must register it online and get an activation code to use its software. Did you not just pay the company 3,000 dollars for the TV? Of course, the TV is yours, but in order to use it, you have to agree to a software licensing agreement, which is for the application software that runs the television. Should you not agree, you cannot use it. Should you not register with your name and information, you cannot use it. It's not yours to use. It's licensed to you. In other words, company X gives you permission to use their software under the conditions that they allow, regardless of what you pay for it. Too much? Exaggeration? Guess what, you're under the same conditions now. The browser you're using, the operating system you're using it on, the programs you run on your computer are all subject to a license that gives you permission to use the software you paid for under the conditions that the company specifies. You agreed to it, and are subject to it, liable to it, even if you didn't read it. Activation is another word for forced registration and use control. You own nothing. They register your computer's hardware code and tie it to the software you're running. If you install the software on another computer, then you must re-activate. They're controlling how and where you use the software you bought. Register, register, register. Article continues below the following preview for my latest photography book, Franco Esteve's Devils Within. Buy it Today! They have your personal information. They have a lot of power. Yet, overall, it's not a big deal. You're using their software legally and that's that. You do it once. It's not annoying or difficult and that's that. The problem is that it's become so pervasive that it's everywhere. It's creeping into our appliances. 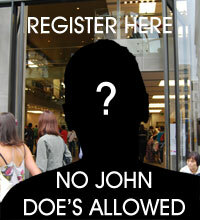 In too many places, we're being asked to register even to shop. I don't mean to buy, but to shop. I don't want to register to look at a catalog. Why should I give my information for nothing? This is all absolute crap. If you force me to register to look at your shop, I won't buy from it. As the web becomes social, what kind of relationships are we being asked to have with the shops we purchase from? What kind of information are we asked to give away and how does that affect our lives and how much privacy are we really giving up? Looking at all the recent hacker attacks upon Sony and others, and how easy it's become for nefarious entities to take over our information either for identity theft or credit card fraud or simply to expose our personal preferences to those who might not necessarily agree with our ideas, it becomes rather jarring to think about how the appliance one bought, the seller of that appliance, and the company behind it might know more than they really should, might have more power than we really know about (as no one reads their license agreements), and might put our identities at greater risk than if we published them publicly on a billboard. Considering the hacks, we must be ever more vigilant. With all the Cloud computing hoopla things can only get worse in this regard as we give up more and more to the net. Be careful out there. Note to companies: It's bad etiquette to ask before you buy, to ask just to look, to force to use. Would you give all of your information including date of birth before entering the Mall? McDonald's? the Gap? or your license and registration before entering the parking lot? I thought not. My life has existed throughout this planet, growing up everywhere and nowhere. I belong to no place and I wouldn't have it any other way. Become a Patron and get rewards! Franco Esteve @Imagekind - Buy art prints! Natural Raw - Photography book now on Apple iBooks! Get it! Ebook Pricing! Franco Esteve's Siurana Spell on CD Baby! - Buy Now! Franco Esteve's The Wait on CDBaby! - Buy it now! Franco Esteve's Quicksand on CDBaby! Consequence: The Doll Chronicles (Original Soundtrack) on CDBaby! Paranoia: The Doll Chronicles (Original Soundtrack) on CDBaby! Franco Esteve's iBoogie Single on iTunes - Get it here! Franco Esteve's iBoogie on CDBaby! - Buy it now! ACLU - Protect your rights! Patreon - Become a Patron! copyright©2018 Franco Esteve. All rights reserved. Simple theme. Theme images by gaffera. Powered by Blogger.